GloboDent | Teeth whitening and sensitivity. 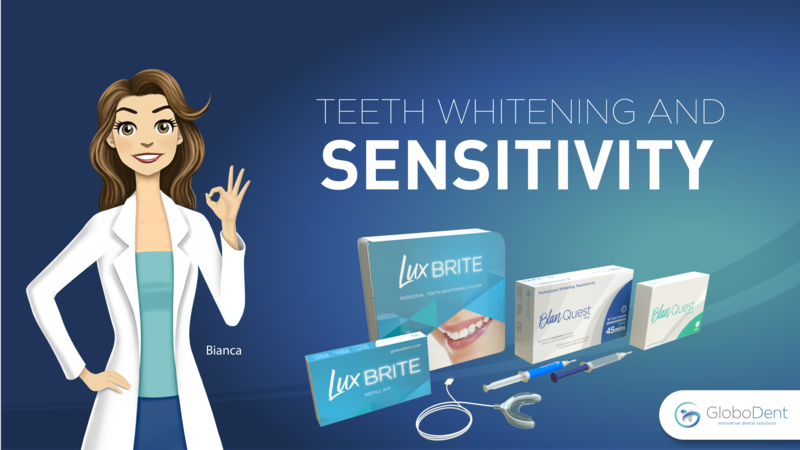 When it comes to teeth whitening procedures, sensitivity is one of the main and most common concerns. Weather the procedure is applied by a dental professional on their practice, or by one individual in their home; a lot of people experience some level of sensitivity afterwards. In order to help you understand why does sensitivity happen, and how to avoid it or cope with it, we’ve come up with a quick guide that´ll come in handy while using GloboDent´s products. Why does sensitivity happen? How is it related to teeth whitening? A few different factors can be related to causing teeth sensitivity. Being that most teeth whitening procedures use hydrogen peroxide as their main ingredient for whitening, the strength and percentage of the gel, along with the time of the procedure tend to be the most important factors to sensitivity. When looking for a whitening procedure, look for treatments that use specially formulated gels with procedures that don’t expose your teeth for a considerably long period of time. GloboDent products use such high quality and specially formulated gels and have designed their procedures to be short and effective, providing maximum results. Other factors that contribute to sensitivity, include acidic diets as they enlarge dentinal tubules, and crack on teeth, as the peroxide is able to enter the pulp tissue through these means, causing sensitivity (zingers). If continued sensitivity occurs, consult your dentist, as there may be some pre existing conditions. How to avoid post- treatment sensitivity? Some sensitivity may also occur due to dehydration of the teeth. Simply drinking room temperature water, will help with some sensitivity issues. People who are prone to having sensitive teeth may choose to take an over the counter analgesic (Tylenol or Ibuprofen) before the procedure. Most GloboDent products/procedures include the GloboDent Remineralizing Gel, which is designed to strengthen and remineralize dental enamel while decreasing risks of teeth sensitivity. Using the remineralizing gel for 3 to 5 minutes after the procedure will help with any risk of sensitivity. GloboDent also offers toothpastes that remineralize teeth while also continues to provide whitening and maintenance to your results. We hope this is helpful. For further information make sure to contact your closest specialist or feel fre to ask a question in our website for a professional to review.